Scientists have long known there was gold in the Coosawattee. 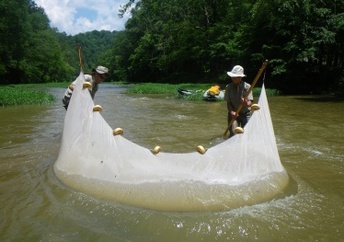 The north Georgia river system coursing through the Appalachian foothills is one of two places on Earth where goldline darters are found. Yet Georgia Department of Natural Resources surveys in the Coosawattee and its tributaries have mined a wealth of aquatic creatures that reaches beyond the federally listed goldline darters. Finds include three more protected darter species, plus mussels documented for the first time above Carters Lake. Dr. Brett Albanese, senior aquatic zoologist with DNR’s Nongame Conservation Section, said the discoveries not only expand the range of the rare species, they spur hope “that having more of them present in the basin will help increase conservation efforts” in the Coosawattee system. With the Ellijay and Cartecay rivers merging to form the Coosawattee in Ellijay, the system drains southwest to Carters Lake, and continues beyond the reservoir to join the Conasauga River near New Echota. One Coosawattee claim to fame is that the river helped inspire “Deliverance.” Another claim: Goldline darters, slim fish dabbed gold on the sides and classed as threatened under the Endangered Species Act, exist only here and in Alabama’s Cahaba River system. As part of a project to assess the darters’ status, the Nongame Conservation Section began surveying the Coosawattee in 2009. That work, covered in a journal article available from Albanese, documented a stable population upstream of Carters Lake, but rated the species possibly extirpated in the lower Coosawattee and Talking Rock Creek (above), a major tributary. Those data are crucial for conserving goldlines. But surveys provided more, thanks to partners including The Nature Conservancy, the Georgia Museum of Natural History and the Coosawattee Watershed Alliance. Although researchers didn’t capture goldline darters downstream of Carters Lake, they did net three other rare darter species: the federally endangered amber darter (pictured in the masthead) and state-endangered freckled and trispot darters. This represents the first documented occurrences of amber and freckled darters in the Coosawattee system and a considerable increase in the global range of the amber darter. 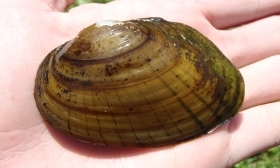 Also, when a survey crew searching for state-listed holiday darters spotted mussel shells in the Ellijay River and Boardtown Creek, biologists followed this year and quickly found populations of two mussel species never collected upstream of Carters – the federally threatened finelined pocketbook (pictured) and state-endangered Alabama creekmussel. They even documented the Etowah heelsplitter, a species of special concern that also may have not been documented upstream of the reservoir. DNR mussel specialist Jason Wisniewski said what interests him even more is the size of the mussels. They’re small. And for these long-lived creatures, smaller means younger. It’s also not all they saw in the Coosawattee system. In 2009, three eastern hellbenders were caught in the Cartecay River, the first occurrence of this mega-salamander in the Mobile River basin, which includes the Coosawattee. A genetic study suggests ties to hellbenders in the Toccoa River. What’s not known is whether the Cartecay hellbenders dispersed naturally from the Toccoa system or whether people introduced them to the Cartecay. 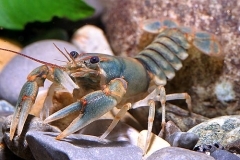 Also, joined by Georgia College professor Dr. Chris Skelton, surveyors found Coosawattee and beautiful crayfish, two species that – like eastern hellbenders – are petitioned for federal listing. Watch this slideshow of Coosawattee system surveys and species. And more emphasis on conserving the system anchored by the Coosawattee, home to more than 70 native fishes. Threats include habitat loss to urbanization and agricultural impacts such as runoff. Having sound information on species of concern, including how rare they may or may not be, is critical for managing them and deciding whether or not they warrant federal listing. Along the Coosawattee, that story of deliverance is just being written. Heading to the mountains for festivals and fall color? Check out the Coosawattee. Prime access is found on the Cartecay Tract (which includes part of the Cartecay River) on Rich Mountain Wildlife Management Area and on Mountaintown Creek, a noted trout stream in Gilmer County. The Benton MacKaye Trail also cuts across the Coosawattee system. Maintain and restore natural vegetation buffers along streams. Reduce the use of chemicals and fertilizers on lawns, gardens and farms. Protect natural areas and minimize creation of impervious surfaces linked to new development. Follow best management practices for erosion control for farming, forestry and development. Friday will mark the quiet close of the 2013 sea turtle nesting season. But make no doubt: It has been a screaming good summer for loggerheads, Georgia’s primary nesting sea turtle. 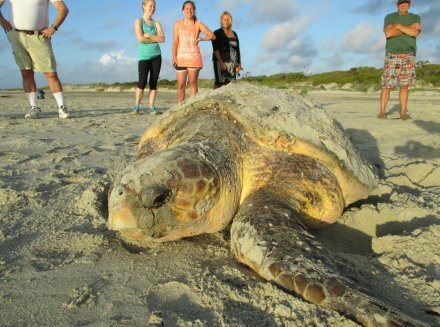 The Georgia Sea Turtle Cooperative documented 2,291 loggerhead nests, the most in a quarter-century of comprehensive surveys on barrier island beaches. 2013 was the state’s fourth consecutive nesting record – easily beating the 2,241 in 2012 – and the second straight summer of 2,000-plus nests. Statistical analysis has shown that the increases indicate a rebound in Georgia for the species federally listed as threatened. Loggerhead nesting in Florida and the Carolinas is also trending upward. Loggerheads aren’t out of deep water yet, according to Georgia DNR Sea Turtle Program Coordinator Mark Dodd. However, the trend “is what we want to see,” Dodd said. He thinks that one federal recovery benchmark for loggerheads – 2,800 nests in a year – could be reached in two or three years. Yet Dodd cautions that annual fluctuations in nest totals are expected, and continued conservation efforts are needed to keep the recovery on track. Green sea turtle nesting also surged in Georgia this year. The Sea Turtle Cooperative, whose members document, protect and manage nests, found 18 “green” nests. The most in recent years had been four. Dodd said this species which primarily nests in the tropics has been expanding its range, and Georgia benefited from spill-over in Florida, which saw its green nest record shattered. Fourteen of Georgia's nests were on Cumberland Island, near the state line. Some of this year’s latest loggerhead hatchlings dug out of a nest on Jekyll Island last week. Quite able to see the forest and the trees, the Forest Management Unit of DNR’s Wildlife Resources Division recently earned the Wildlife Management Excellence Award from the Southeastern Section of The Wildlife Society. The honor recognizes an agency or department whose work promotes wildlife conservation and management, and provides economic benefits. Eight young whooping cranes are almost a month into their aircraft-led migration from Wisconsin to Florida. The group is the 13th to make the trip organized by the Whooping Crane Eastern Partnership and aimed at reintroducing the imperiled birds into eastern North America. The flight path crosses southeastern Georgia. Map. In the field blog. The Great Squirrel Migration of 2013 could be this fall's quirky historical footnote, considering the bunches of bushy tails on the move – and dead on the roads – in the Georgia mountains. DNR biologists attribute the mass emigration to a heavy acorn crop in 2012 that resulted in more squirrels being born this spring, followed by a lean hard mast yield this fall that left squirrels scurrying for food, even if it meant swimming across Lake Blue Ridge. This history is a repeat: Read about the 1968 event. 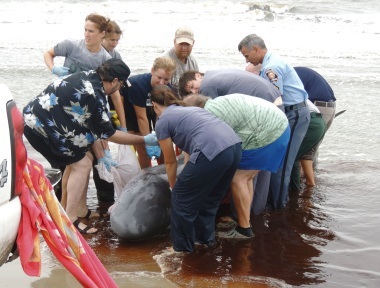 A pygmy sperm whale that washed ashore at Jekyll Island Oct. 15 suffered from a gastric impaction likely caused by ingesting plastic. The nearly 11-foot whale had to be euthanized. Pygmy sperm whales probably ingest plastic by mistake while using sonar to hunt for squid, their favorite prey. Report marine mammal strandings to the Georgia Marine Mammal Stranding Network, (800) 2-SAVE-ME (1-800-272-8363). Working Lands for Wildlife is working for Georgia’s gopher tortoises. The initiative by the Natural Resources Conservation Service and the U.S. Fish and Wildlife Service has teamed with DNR biologists to work with private landowners, who control 80 percent of gopher tortoise habitat. Read more in this article. Environmental Quality Incentives Program applications for 2014 are due by Dec. 6. The Natural Resources Conservation Service program funds conservation practices, including managing wildlife habitat, based on natural resource concerns that affect qualified land uses. Details. Southwest Georgia landowners will be interested in a field day organized by the Georgia Forestry Commission and covering everything from gopher tortoises to hunting leases. The landowner field day is Nov. 7 at Forest Lodge Farms near Camilla. Details, RSVP: (229) 386-3845. The death of a red-tailed hawk resulted in a citation for a Hart County man this month. Following up on a complaint, Cpl. Craig Fulghum found the hawk and cited the man who shot it with a .22 for taking a protected species. Receive weekly ranger reports. Alien invaders – invasive plants and animals – are the focus of the Georgia Exotic Pest Plant Council’s annual meeting and conference, set for Nov. 6 at Middle Georgia State College’s West Campus in Macon. Keynote speaker Dr. Julie Lockwood of Rutgers University will discuss population biology for exotics and implications for management. A redbreast comeback in the Satilla River is due in part to fewer invasive flathead catfish, which eat the sunfish. Although the Wildlife Resources Division’s Fisheries Management Section began removing flatheads in 1996 -- the year DNR discovered they had been illegally introduced into the Satilla -- a full-time management program started in 2006 has taken out more than 51 tons. Read more. The northern long-eared bat warrants listing as endangered, but the eastern small-footed bat should not be listed under the Endangered Species Act, the U.S. Fish and Wildlife Service announced. Both species are found in Georgia. The proposal to list northern long-eared bats – which are primarily threatened by the disease white-nose syndrome – opens a 60-day public comment period. Connecting with the caving community, Nongame Conservation Section biologist Trina Morris and Nikki Castleberry of the Georgia Museum of Natural History set up a booth with educational information – and crafts for kids (left) – at the TAG Fall Cave-in on Lookout Mountain. Cavers help DNR with surveys and information about caves and bat resources, a relationship made even more critical by this year's discovery of white-nose syndrome in the state. Weekend for Wildlife registration opens Nov. 1. This annual fundraiser for Georgia's Nongame Wildlife Conservation Fund -- the central source of support for DNR's Nongame Conservation Section -- is set for Jan. 31-Feb. 1 at Sea Island. Names in the news: Nongame Conservation Section Chief Mike Harris and Assistant Chief Dr. Jon Ambrose chaired the Wildlife Diversity Committee and State Wildlife Action Plan Committee at the annual Southeastern Association of Fish and Wildlife Agencies meeting in Oklahoma City. At the meeting, DNR Ranger 1st Class David Webb was awarded Best Presentation during the Law Enforcement Technical Session for his presentation on Operation Something Bruin, a four-year undercover investigation into poaching and commercialization of black bears. Nongame senior wildlife biologist Nathan Klaus coordinated a field day Oct. 1 for landowners on Pine Mountain, a site harboring much of Georgia’s remaining old-growth montane longleaf pine. Nongame Program Manager Matt Elliott co-authored a paper in the recent Herpetological Conservation and Biology journal on the range-wide historical and current distribution of eastern indigo snakes. Professor Robert Warren of UGA's Warnell School of Forestry and Natural Resources received the 2013 Excellence in Wildlife Education Award from The Wildlife Society. 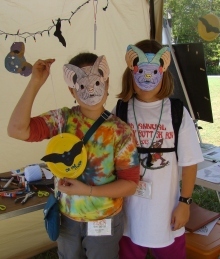 Nov. 1: Weekend for Wildlife 2014 general registration opens. Nov. 3: Volunteers needed to help collect grass seed for restoring native grasslands on state lands. Collection starts at noon on Black Creek Natural Area, Taylor County. Details: Nongame biologist Nathan Klaus. Nov. 6: Georgia Exotic Pest Plant Council annual meeting and conference, Middle Georgia State College (West Campus), Macon. Nov. 8-10: Becoming an Outdoors-Woman, Charlie Elliott Wildlife Center, Mansfield. Got a story idea or comment? Email rick.lavender@dnr.state.ga.us. ** Forest Management Unit honored: from left, Game Management Section Chief John Bowers, natural resources biologist Chris Roberts, Assistant Program Manager Dan Minnick, Program Manager Matt Payne, biologists Forrest Buckner and Jeremy Whigham, Game Management Assistant Chief Ted Will. other nongame wildlife. Nongame includes wildlife not legally fished for or hunted, plus native plants and natural habitats.